"Shrimp tempura, Japanese style. Serve this at dinner as an appetizer or to your party guests as finger food." Whisk flour, cornstarch, and salt in a large bowl. Make a depression in the center of the flour. Stir in the water and egg yolk. Mix just until moistened; batter will be lumpy. Stir in egg whites. 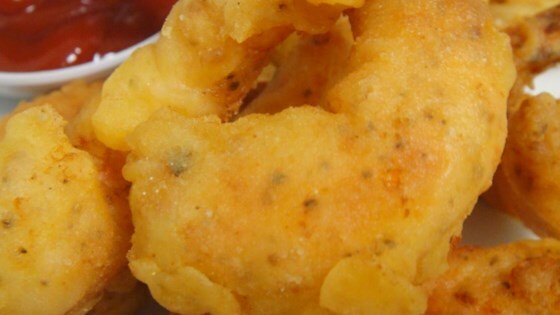 One at a time, dip shrimp into the batter to coat. Do not batter tails. Carefully place a few shrimp at a time into the hot oil. Fry until golden brown, about 1 1/2 minutes. Drain on paper towels. Used this tempura recipe yesterday because I could not find my usual tempura recipe. The batter was bland and not crispy at all. Very disappointed. This was pretty bad. It tasted like shrimp wrapped in egg white. I stopped making them in the middle of cooking and used the shrimp with another recipe. This recipe is a waste of time. For a bit more flavor I used 1/4 tsp each of salt, pepper and onion powder. I was using it on veggies so wanted a bit of flavor in the batter.